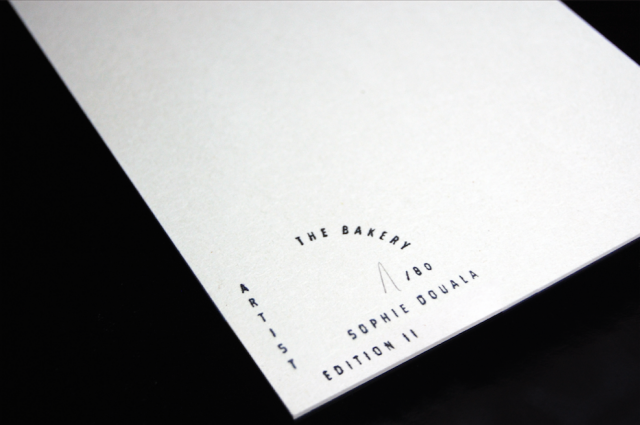 TB What was your reaction when you got to know you would be the one to design the 2nd THE BAKERY edition? Can you tell us about your approach and inspirations as well as the process resp. the diverse steps for your final creation? I responsible to design the illustration but also to choose the paper, find ideas for its presentation in the envelope, decide about the envelope… it was a lot of research. The challenging point of the collaboration was that I had to fly to Paris a week later after they had proposed me the project. So I had to collect so many papers, envelopes, cards before actually having the illustration made in order to be able to work from Paris. I had to adjust and work a bit backwards. TB How does the final draft you came up with relate to THE BAKERY itself? SD During our meeting, Ann mentioned that it would be nice to make an artwork with some references or influences from THE BAKERY. I always compare THE BAKERY to a family where Ann and Benedikt take great care of their freelancers. For this special illustration I imagined a surrealistic family house to highlight the way they are working with us, with trust and optimism. TB Do you listen to any music while working and if so does the music you listen to influence the creation? If your creation for the 2nd THE BAKERY edition would be a song what would it be or sound like? SD I very often, if not always, listen to music when I am working. Music is another passion of mine and I like it a lot to discover new artists and bands. I never thought about this interaction before, but probably in a way music influences my work as I´m in a certain mood that is triggered by the music I listen to. When I was working on the illustration for THE BAKERY edition, I think I was listening to James Blake and Thom Yorke a lot. The album “Faith in Strangers” by Andy Stott was also recently released and I was crazy about the track “Faith in Strangers”. I think it definitely represents the vibes and mood I tried to convey in my illustration! TB Regarding the shapes your work is very graphic, very clear but on the other hand it has this vibrant qua- lity of color and texture. Are you working more intuitively when deciding about the combination of shapes, colors and textures or do you follow a certain scheme? TB Speaking of architecture: The 2nd THE BAKERY edition reminds me on the one hand a little bit of M.C. Escher because it suggests this architectural space with the staircases but on the other hand it also has the air of building blocks and looks way more reduced and playful than Escher ́s creations. Did you have a certain „image“ in mind resp. do you want to suggest a certain picture or feeling – or is it rather open for interpretation? 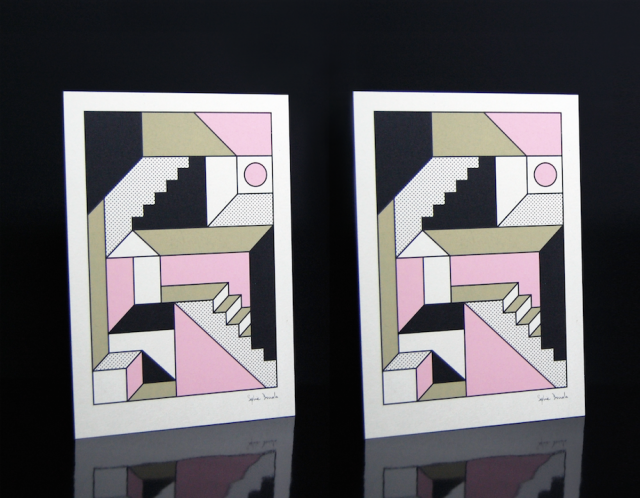 SD Some friends of mine also compare my work to M.C Escher – and that is definitely flattering. That said, it’s not an image I was suggesting on purpose, but we are sharing some common interest. In my work, however, I want to encourage different interpretation and different feelings because the variety of interpretation makes it interesting. Especially as the purpose of any artistic work is – in my opinion – to open a gap into the imaginary world. 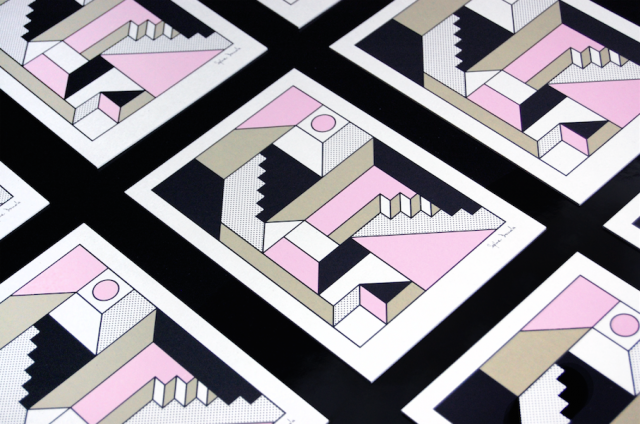 TB Have you actually been inspired by any architectural space or structure for the print? SD While creating the piece I didn’t have in mind any specific space or structure, I was exploring the general idea and concept around the structure of a family house. Now that I am observing the illustration it occurred to me that I was probably inspired by my childhood home! The structure is very similar! TB Almost each of your works could be a pattern for textiles – and you also said earlier that you´re influenced by fashion. So would you actually like to use your pattern for the print on textiles in the future, too? SD When I was younger I wanted to be a fashion designer. That idea brought me to study at an art school after my A—level. Today fashion influences my work a lot and I would really like to experiment more in that direction and print some illustrations on textiles. Actually at the moment I´m working on some patterns for scarves! TB So… as a last question: Let ́s take the edition print – on which piece of clothing would you like to see it? A shirt, a dress, a suit… something completely different? SD I think THE BAKERY edition could fit as a big motif on the front of a white t—shirt. The colours are very dream, it would be quite nice for summer!